Critical-Gaming Network - Blog - Overused Words? Recently on a GFW podcast, Rod Humble talked about the words he felt he couldn't/shouldn't say when talking about the Sims games just because they're overused in the video game industry. The conversation reminded me of when Garnett Lee on the 1up podcast expressed how much he hated the word "gameplay." Because of how "gameplay" was misused or overused, Garnett developed a negative attitude for the word. These are just a few of the "problem" words. Now NeoGAF is addressing the same issues. Based on some of the responses, it seems there are some who don't understand how language works. In efforts to express ourselves, we create words with definitions so that when we say one thing, its meaning is distinct and separate from other possible meanings. So without words like gameplay, intuitive, and emergent it would be very difficult or tiresome to explain these ideas. Perhaps the issue stems from the lack of real critics in the games industry; critics who know how games works, who can employ the language necessary to discuss games, and who can hold others accountable for what they say. In the meantime, don't get upset about the words. Rely on the definitions, theories, and design principles covered on this blog and we'll actually be able to talk about games instead of acting like the majority of this industry. This reminds me of a countdown of game cliches on Digg. Had to look it up. Good find. I read the first 15. I think I'll save the rest for later. 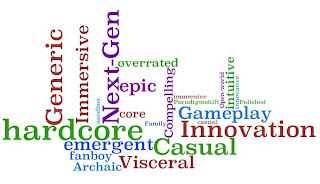 I think that as games writing is adopted by more wider publications and we all realize the trouble in actually describing what it feels like to play a game then this vocabulary will probably fall behind other new words invented to fill that gap.